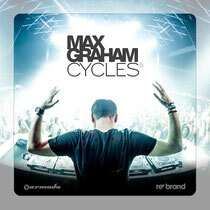 Max Graham has mixed the fifth edition of his ‘Cycles’ compilation series. ‘Cycles 5’ features a continuous mix of 18 hand-selected tracks that, as the album title suggests, move through phases of trance, techno, progressive trance and deeper melodies to take the listener through a sequence of highs and lows. Max Graham has continued to support new names and experiment with musical boundaries and this free spirited approach has given him the liberty to carve his own path, whether in his original productions, live shows or the music he chooses to promote on his radio show. ‘Cycles 5’ highlights once again Max's preference to seek out unknown tracks by underground artists, and this mix hints at flavours of Ibiza, India, Morocco, Miami and other exotic locations. Continuing the journey started by the first four in the compilation series, ‘Cycles 5’ is out January 17 on Armada Music.